For those of you who were “too cool” to attend any of the films in the multi-billion dollar franchise which is The Twilight Saga, you aren’t missing much. But, with that in mind, it makes complete sense that creator Stephanie Meyer would be ready and willing to capitalize on another franchise, now that her vampire/werewolf/emo chick love triangle is coming to an end. 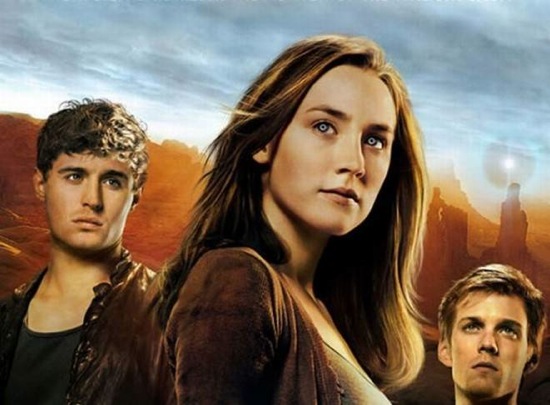 Enter The Host, which hit bookshelves back in 2008. Toted as being “Science fiction for people who don’t like science fiction”, the book is said to be a bit of a departure from Meyer’s Twilight universe. Here’s the synopsis. Set to hit theaters on March 29th of next year, the film has plans to take star Saoirse Ronan (Hanna) and possibly construct her into the next Kristen Stewart with this upcoming adaptation. Take a look at the first trailer after the jump, and be prepared to be dazzled by a series of photoshopped images of creepy eyes. Saoirse Ronan is not only starring in Twilight author Stephanie Meyer’s The Host, but is now attached to headline yet another Snow White centric flick called The Order of the Seven. The film will have a completely new spin on the old story. It will follow a centuries old and once revered Order of Warriors from around the world, who are now a jaded group of outlaws, as they reclaim their destiny after the reemergence of an ancient evil empress. Ronan will play Olivia Sinclair, a British ex-pat of 19th Century Hong Kong who guides the warriors back to their noble roots. The film will be lined with stars from China, Russia and Japan. Ronan has been making a name for herself over the past few years as she has taken on larger and larger roles, which have included Peter Jackson’s The Lovely Bones, the Oscar-winning Atonement and not to mention the action packed Hanna. This will be her first leading role. The concept of the insane upper-class citizens is one that has gone to the wayside over the past few years. There are some great films that incorporate the plot twist, such as Swimming with Sharks, but most insane antagonists in film tend to be members of the unwashed and broke. That’s where Nick Tomnay’s The Perfect Host comes in. Based on his original 2001 short, The Host, the film takes the classic hostage tale and spins it around. Here’s the official synopsis. Warwick Wilson is the consummate host. He carefully prepares for a dinner party, the table impeccably set and the duck perfectly timed for 8:30 p.m. John Taylor is a career criminal. He’s just robbed a bank and needs to get off the streets. He finds himself on Warwick’s doorstep posing as a friend of a friend, new to Los Angeles, who’s been mugged and lost his luggage. As the wine flows and the evening progresses, we become deeply intertwined in the lives of these two men and discover just how deceiving appearances can be. David Hyde Pierce takes on the role of Warwick, which is great seeing as how Pierce has been stuck with the fumbling, British comic relief for so many years. It will be nice to see him try out “nut case” for size. Check out the trailer after the jump, and catch The Perfect Host on demand on May 27th and in theaters on July 1.